Crystal clear skies and very cold temperatures (-7°C overnight) led to some spectacular sunrise and sunset displays in the middle of February. 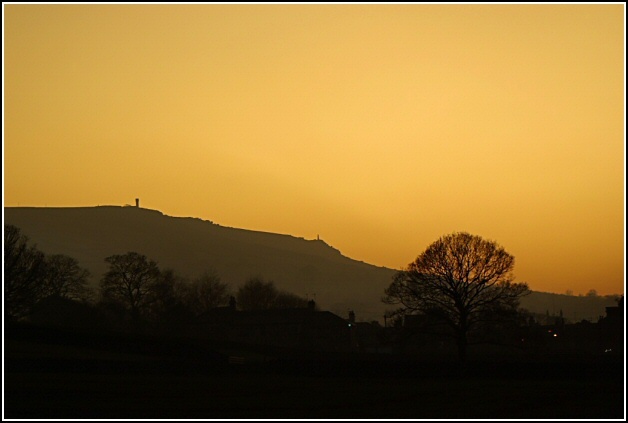 This shot was taken at sunset on Monday 18 February 2008 from Sutton Lane, down towards Knott Lane, looking up to the village with Earl's Crag rising in the background. The sky filled with a beautiful golden glow, the likes of which I've not seen before and probably never will again - well, not above the Sutton skyline.